Okay, let’s just get right to the point. I don’t like having my teeth brushed. In fact, I don’t think it’s overstating it to say that I flat-out despise having my teeth brushed. And I’ve got good, solid reasoning on my side. I have very little control over the outside of my body. People (You know who you are!) are always picking me up without warning and putting me places I didn’t ask to go and wiping my face off without asking (Those wash cloths totally cover my mouth and nose, btw. Suffocation = not cool.) and putting clothes on me without even asking my opinion (Yes, I do have an opinion, and it is a valid one even if I can’t articulate why those purple pants bother me or why the brown shoes feel better than the blue ones.) and the list goes on. So losing control of the inside of my body is a really, really big deal! Ever heard of a gag reflex? If not, you should Google that. It’s real. I like choices, so how about offering some? You can let me choose between two brushes or two toothpastes or whether I want to brush before or after my bath. I may still be a bit resistant, but I’ll feel a little more in control of what happens to me. Speaking of choices, there are tons of toothbrushes out there, and some even have handles so I won’t feel like it can go down my throat and some have soft bristles all the way around the top so I can chew on it and get a lot of brushing out of the way painlessly. Who knows, it might even feel good on these aching gums! This should go without saying, but seriously, remember the sore gums, gag reflex, etc. Be aware. Be careful. Be gentle! Again, this should be obvious, but I am a real, live, thinking person with real, valid feelings, so how about asking if I’m ready to have my teeth brushed? And if I’m not ready, how about respecting that and modeling a bit of that patience you want me to learn (At least, I’m guessing that’s what you want me to learn since every time I ask you to play with me or get me something you say, “Just a minute, honey.” Just saying.) and waiting a few minutes. We could read a book or sing a song or something to get me in the toothbrushing mood. And speaking of modeling, go ahead and brush your teeth first while I hang out on your hip and watch. Seeing that it doesn’t hurt you and that everyone has to brush their teeth is very reassuring. Better yet, let me have a crack at brushing your teeth before you brush mine. Turn-about is fair play, right? I really do need to feel like I have some control over my body (Foundation for potty transitioning and all that sort of thing, you know.) so how about letting me brush my own teeth first and then you just finishing the job up and getting in all the hard places? Silliness is my language, so definitely get your funny-bone in action. Try calling toothbrushing more palatable names like ‘tickling the ivories’ or ‘tackling the tooth monsters’ or ‘tickle teeth time.’ I may or may not go along with your goof-ball approach, but I’ll appreciate the effort. Get your groove on and start singing your way to sparkling teeth. You can make up toothbrushing words to the ‘A,B,C Song’ or ‘If You’re Happy and You Know It’ or whatever song you like. Something like “This is the way we brush our monkeys…no, that’s not right…This is the way we brush our toes…” combines silliness with singing. Win-win! By the time you’re done messing up the song my teeth are all brushed, and I’m giggling so hard I don’t even realize it! Well, that about covers it. Give it some thought, will you? Your toddlers will thank you! Remember, parents, gentle approaches to childhood issues won’t necessarily ‘work’ to eliminate normal behaviors, and resisting toothbrushing is a totally normal behavior, unfortunately. Gentle parenting is about working with your child through normal behaviors as kindly and respectfully as possible. They may still resist, but they will get that you aren’t just forcing things on them. Over time, your gentle and respectful approach will bear fruit, though, in a healthy, connected relationship. This entry was posted on June 27, 2013. It was filed under toddler, Uncategorized and was tagged with fatherhood, motherhood, parenting, tantrums, toddlers, tooth brushing. You mention a brush with soft bristles all the way around. What brand and where do I find them? But even that brand doesn’t have bristles all the way around the brush; can you cite the actual toothbrush you are writing about because, I can’t find anything like that online. Thanks. 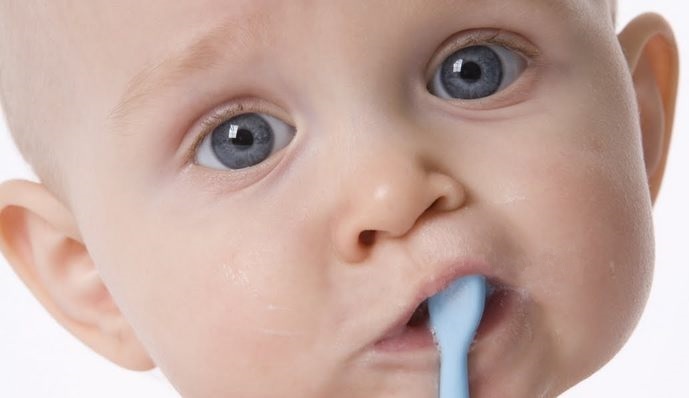 We have our toothbrushing song, https://www.youtube.com/watch?v=W4Q1TFSE5fI , it begins something like this: this morning’s report from radio Cuba:there is opened the toothbrush service, la la la…..:) She loves it, she chews the toothbrush and humming that song. my son brushed his own teeth from 9month that when his first 2 came we brush teeth together usual when he sitting in bath… i sing silly song as i brush teeth and jamie now humms as he cleans his 8 teeth… he loves doing his teeth and he has a huge smile on face when i sign toothbrush… one rule i do have is that he sits if in bath cleaning teeth or he stays in bathroom if not in bath..
None of this works for us. We brush together, he has multiple brushes, fun flavored toothpaste and still, he screams his head off when it’s time for me to brush his teeth. I don’t know what to do ..
My 3 year old also has SPD and we give him the choice between the brush or a tooth cloth. He chooses the cloth every time. We also sing a song that allows us to get a bit silly but also he knows when the song is done we are done brushing. His mouth is so sensitive and he is so easily traumatized by invasive proceedures we still haven’t been to the dentist yet, so I hope what we are doing is good enough. We do try to limit candy and sweets. This is a gift of perspective sure to bless many families! Thank you so much for sharing with the Tuesday Baby Link Up Community! Good one. David loves his electric toothbrush but only when he is holding it himself. He tolerates, SOMETIMES, when grandma “helps”.